Below is a review of Your Beautiful Purpose from Bethany House. I received the book to read for free in exchange for this review. All opinions, as with all of my reviews, are 100% my own. Lately, I’ve been throwing myself toward ‘Running for a Reason’ and trying to lose weight. It’s been a battle, and to say it hasn’t had its moments would be crazy (because it has, today even!). In this journey, I’ve given up a lot of things, including sitting down to take the time to read a good book. After having the day like I had today, you had better believe my eyes turned to the sky and I thanked God that I signed up to do this book review. 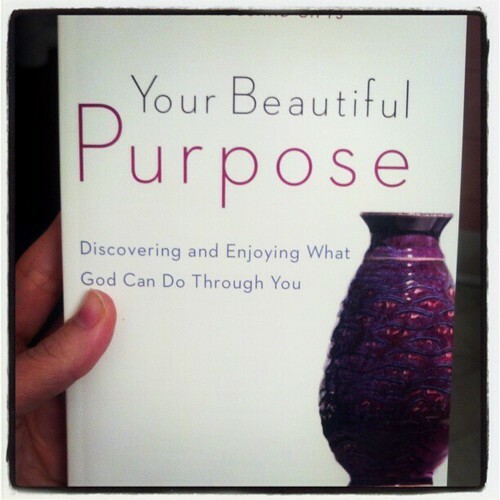 Following my run, I saw “Your Beautiful Purpose” by Susie Larson on my nightstand. I just knew it was time to give it a read. While my husband worked through making supper, I worked through starting to remember what this whole journey is about, thanks to this book. You see, all of us have a purpose, a calling. We just have to tune our ears to that purpose and it will find its way. That’s God’s plan (and we never should question it). The cover promises the read involves “discovering and enjoying what God can do through you”. While, admittedly, I’ve only read one chapter*, the book has already given me some “aha” moments, and I’ve remembered why 1) I chose life for Arianna 2) I moved back to Pennsylvania 3) I started running and 4) am running for Kids with Cancer. All in one chapter, I am seeing just a handful of blessings. The next five chapters are sure to turn on even more lights in my dim eyes and I will see more of what is meant to be. If you are looking for your purpose and trying to put light back in your life, give this book a try. I’ll be over here reading through it in my quiet moments, and anxiously seeking more of what God has in store. * What I love about the format of the book is that you can read 2 chapters a week as a 6-week study. That is what I plan to do, giving myself time daily to read the suggested Bible passages in the extension questions and find ways to discuss the study questions with those closest to me. It would be great to use this book as a women’s study among close believers! You can pick the book up through Bethany House or your favorite online book retailer for around $14. This entry was posted in Book Reviews and tagged Faith, purpose. Bookmark the permalink.